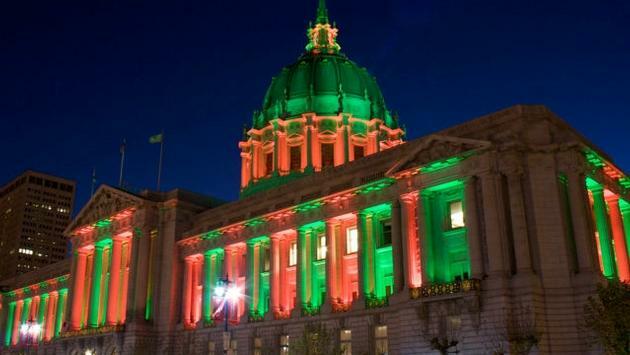 We may not have snow in the San Francisco Bay Area, but we have plenty of holiday cheer. Since we don’t have to worry about freezing while outdoors, we can actually delight in strolls throughout the city while admiring the twinkling lights, Christmas trees, garlands, wreaths and more that can be found adorning each street and square. For those interested in a snowy getaway, the lush winter wonderland of Lake Tahoe is just three to four hours away. Skiing, snowboarding, sledding and the rest of your adrenaline-pumping activities can be done there, in addition to getting cozy in upscale mountain cabins and accommodations. In case you have yet to book your holiday plans (including New Year’s Eve), TravelPulse has rounded up the most spirited offers now available throughout the Bay Area and beyond. Located across the street from the iconic Ferry Building, (and just a short distance from Pier 39 and Fisherman’s Wharf), the Hyatt Regency San Francisco is ready for the holidays. Guests can experience a VIP Breakfast with Santa Package which includes a bay view balcony room, breakfast with Santa for all persons on the reservation, access to regency club lounge, a complimentary holiday gift for children and four complimentary admission tickets including skate rentals to the holiday ice rink located adjacent to the hotel. Also offered is Skate & Play, a special that offers a daily breakfast buffet for two at Eclipse Kitchen & Bar plus two admission tickets including skate rentals to the nearby ice rink. For a memorable three-course Christmas prix-fixe dinner, head to Pescatore at Hotel Zoe San Francisco. Located on Fisherman’s Wharf, just off North Beach, this Italian sidewalk café is offering a feast of Italian favorites including sole ceviche, butternut squash soup, braised veal shank, California halibut and pear crostatas for dessert. For more information, click here or call 415 561 1111. Americano Restaurant & Bar, Hotel Vitale’s waterfront restaurant situated on The Embarcadero, is known for its small plates and seasonal Italian fare. This year, Executive Chef Josua Perez is offering a special menu on Christmas Day. Guests indulge in a three-course, prix-fixe meal that includes delectable holiday offerings such as crispy pork belly, Dungeness crab, roasted duck breast and a festive variety of desserts including flourless chocolate cake with eggnog ice cream. Children 12 and under are $35 per person and will be offered the same items at smaller portions. Moreover, the chef will be able to prepare special items for children under five years old. For more information, click here or call 888 890 8688. Americano Restaurant & Bar will also be hosting a special Confetti and Cocktails event, complete with DJs and champagne, on New Year’s Eve. from 9 p.m. until 2 a.m. Hotel Vitale is San Francisco’s only waterfront luxury boutique hotel with front row seats to the city’s Bay Fireworks show. EPIC Steak, one of San Francisco’s top steakhouses, will be hosting a bountiful prix-fixe dinner on New Year’s Eve with two seatings: 5:30 p.m. and 8:15 p.m. The first seating features a four-course dinner, and the second will showcase a five-course dinner. The dinner has a menu by Executive Chef Parke Ulrich, with highlights including sautéed Nantucket Bay scallops, Wagyu steak carpaccio and pepper braised short rib. For dessert, expect tiramisu trifle and a salted caramel flan. At midnight, the night only gets better with a complimentary champagne toast, music and an unbeatable view of the Ferry Building fireworks. Next door to EPIC Steak is Waterbar—San Francisco’s foremost seafood restaurant—which will also be hosting a multi-course prix-fixe dinner on New Year’s Eve with two seatings: 5:30 p.m. and 7:45 p.m. The first will feature a four-course dinner and the second has a five-course dinner. Crafted by Executive Chef Park Ulrich, the tasty menu includes a variety of items to choose from, such as king salmon miso soup, chilled Maine lobster salad, hamachi tataki, dry aged New York roast, and pan-roasted black bass. And for dessert, enjoy Meyer lemon chiboust. At midnight, guests also savor a complimentary champagne toast, music and views of the Ferry Building fireworks. Stanford Court invites you to get into the holiday spirit with its “Deck the Halls” Christmas package and “Happy Hanukkah” package. The hotel has incorporated festive cheer into each offering to ensure guests make the most of the holiday season and create lasting memories during their winter stay. The “Deck the Halls” package includes overnight luxury accommodations at Stanford Court, a holiday dessert upon arrival, a guestroom adorned with festive holiday décor including strung lights and stockings, a decorated tabletop Christmas tree and a $50 gift certificate to the San Francisco Ballet to see the Nutcracker. The “Happy Hanukkah Package” includes everything in the previous package, but instead of the Nutcracker, guests get a special gift from Stanford Court for each night of their stay, Hanukkah-inspired décor and two tickets to the Contemporary Jewish Museum. Even if you’re not staying here, stop by to see Stanford Court’s 15-foot Christmas tree and sip on a special holiday Nob Hill Merry Mule at the newly redesigned bar. This signature holiday cocktail is being crafted from San Francisco-based Seven Stills California Courage Vodka, Bundaberg ginger beer, fresh lime and a sprig of rosemary ($15). For more information, click here or call 855 968 3430. The Grill at The St. Regis San Francisco is offering three special holiday dinner menus for Christmas Eve, Christmas Day and New Year’s Eve. With each menu, the culinary team presents re-imagined classics, incorporating locally-sourced seasonal ingredients and honey from the hotel’s proprietary beehives. The menu for Christmas Eve and Christmas Day feature pan-roasted Alaskan halibut, prime ribeye plus a chocolate and raspberry yule log for dessert. New Year’s Eve’s menu will offer sea scallops, Maine lobster tail, prime ribeye and a bittersweet chocolate mousse for dessert. A champagne toast is also included. For more information, click here or call 415 284 4188. For the ultimate winter experience, head to The Ritz-Carlton, Lake Tahoe, located mid-mountain at Northstar California Resort, which will be offering several festive experiences for the holidays and New Year’s Eve. This modern luxury mountain retreat will host a holiday dinner on December 24 and 25 at signature restaurant Manzanita, featuring holiday-inspired specials designed by the chef de cuisine. Also available is an extravagant holiday buffet on December 25, with seatings from 3:00 p.m. to 7:00 p.m.
Lastly, guests are invited to ring in the New Year at Manzanita, which will feature a menu of holiday-inspired fare. Another option? Celebrating New Year’s Eve with your choice of bubbly. The Champagne Bar offers a variety of sparkling wine, including Moët & Chandon, Ice Impérial or Blanc and Rosé by the glass or by the bottle. The package includes two nights in a luxurious guest room at Hotel Healdsburg, Dry Creek Kitchen’s New Year’s Eve Celebration Menu for two, a $100 credit to use at The Spa Hotel Healdsburg, a welcome bottle of Sonoma sparkling wine, an enhanced holiday harvest breakfast daily and valet parking. For more information, click here or call 707 431 2800. Ring in the New Year at h2hotel—the LEED Gold Certified sister property of the acclaimed Hotel Healdsburg. Celebrate the arrival of 2018 with a two-night stay at h2hotel and a celebration dinner at Spoonbar. Co-Executive Chefs Casey and Patrick Van Voorhis will prepare a five-course New Year’s Eve menu with seasonal delicacies and a decadent dessert bar. After a night of partying, guests will wake up to an enhanced holiday breakfast complete with coffee and mimosas. The special package includes a two-night stay in an eco-chic guest room, welcome bottle of sparkling wine in the room, five-course dinner for two at Spoonbar, plus a late night dance party with a DJ, photo booth and more. For more information, click here or call 707 922 5251. Wine connoisseurs will love the Napa Valley Wine Train, a memorable experience that showcases the beauty and dynamic nature of the region. Ring in 2018 with its New Year’s Eve. Dinner Train on December 31. The celebration begins at 5 p.m. as guests sip on a welcome glass of wine or champagne and enjoy appetizers that include local cheeses, charcuterie and poached shrimp in the train station before embarking on a journey through Napa Valley’s countryside. The celebration on board begins with a glass of wine and a four-course gourmet meal featuring slow braised citrus pork belly or pacific smoked salmon ciabatta toast, plus numerous entrée options such as sliced tenderloin of beef, fresh basil ricotta ravioli and tarragon-dusted Maine lobster cake, followed by dessert. For more information, click here or call 800 427 4124. La Toque will host the Sixth Annual New Year’s Eve Gala, featuring a champagne reception and passed hors-d'oeuvres on the covered terrace, followed by a delectable six-course dinner. The sommeliers will choose wines from the Grand Award-winning cellar to offer as pairings for the evening. Guests can retire to the La Toque terrace for after-dinner beverages and mignardises or join the Red Tie Affair Party to ring in the New Year at BANK Café & Bar. There the lobby bar in The Westin Verasa Napa will transform into an opulent dance floor with music provided by dancing from DJ Nor Cal Sound. Guests can munch on a selection of petite sweet bites while they ring in the new year in style. Just before the stroke of midnight, The Westin Verasa Napa will break out the champagne to count down to 2018 with a celebratory toast. For more information, click here or call 707 257 5157.